Generally, when some things start off small and gain a following, it will inevitably become popular and go mainstream. Sometimes it completely takes off due to social media, TV and the sort. 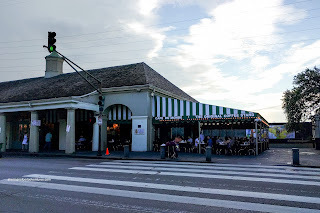 I'm not sure if Cafe du Monde fits into this category completely, but it certainly hasn't hurt that it has been in all forms of media including the movie Chef. It is almost placed on a pedestal being the holy grail of beignets in New Orleans. For myself, it has been on my bucket list since I can remember and it was quite exciting to finally visit the famed coffee shop that serves fried dough doused with enough powdered sugar to make Tony Montana proud. Viv and I decided to work off our calories by walking from out hotel to the French Quarter (I'm sure that didn't burn off much). 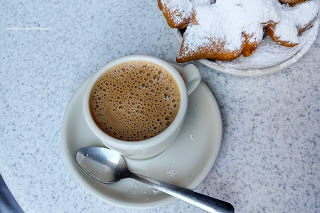 Our first stop was Cafe du Monde for some breakfast (yes a real healthy one). We went for 2 orders of the Beignets and waited in large outdoor seating area. These arrived with mounds of powdered sugar that wasn't as sweet as it looked. In fact, we had to mop up the sugar from the plate with the beignet as we ate. About that beignet, it was a bit dense in some spots but also light with little airy pockets strewn here and there. Was it amazing? No, but it was good nonetheless and we finally fulfilled another bucket-list item. For myself, the real draw was the Cafe au Lait as it was aromatic and went down smooth. The half and half of hot milk and coffee was a nice balance where the strong coffee was present without being too bitter nor was the drink too milky. 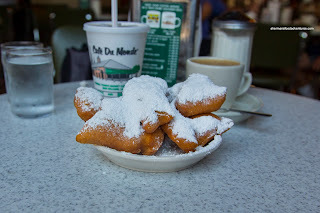 It was the perfect compliment to the beignet as the sweetness of the sugar was counteracted by the slight bitterness. The addition of roasted chicory added another layer of flavour that was subtle yet chocolatey. Viv had the Iced Coffee since it was already hot in the morning and it was fine for what it was. I felt that the hot coffee activated the aromatics while the cold coffee was just a beverage. 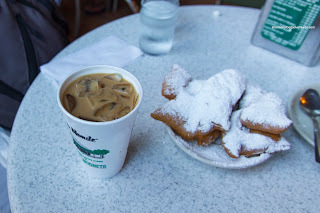 So did Cafe du Monde live up to the astronomical expectations? Probably not, but was still fun to visit anyways.